I wrote very recently about a gem in our community, a lovely little independent local business that is by title a framing shop but is by passion an art gallery. I was delighted when Frames & More owner Florence called and asked if she could send me an invitation to their upcoming art show opening. Not only could she send me one, I replied, I would definitely attend. And not only would I attend but I would bring my entire family, my husband and the Intrepid Junior Bloggers, all of whom are art fans as well. 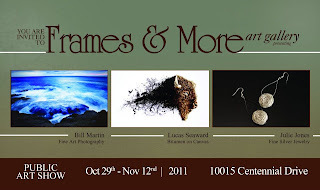 So, on Friday of last week we headed down to Frames & More to check out the work of some local artists. Now, one of the Intrepid Bloggers and my husband had not been to the store previously, so I was very pleased to see their reaction when we arrived. They both smiled, as I knew they would, and we almost instantly dove into the works on display. The store is not a large space and yet they managed to fit in the work of several artists. First up for our viewing was the photography of Bill Martin. I enjoy photography, and I like taking photos, but confess to being quite poor at it. I am thrilled to see photos that excite your senses, that evoke emotion and make you want to reach out and touch the scene. Bill is a master at this, and the most stunning thing about his photos are, without a doubt, the incredible colours. Dramatic, crisp, scintillating - I don't really have enough adjectives for the colours in his palette. His photos are landscapes, and they range in location from Hawaii to the mountains to the prairies to our own backyard in the RMWB. There is an incredible beauty to them, and some of my favourites are the wonderful panoramas, perfect for above a sofa or those spots that are awkward to fill with traditional paintings. Bill is clearly very talented, with a sharp eye for composition, and his sense of colour is, in a word, breathtaking. Next up for the Intrepid Bloggers and I were the jewelry pieces from Julie Jones. I've mentioned before my weakness for things that sparkle, and I'm afraid the Junior Bloggers share this trait. We spent much time admiring Julie's work, which ranges from delicate silver pieces to those that are more chunky and substantial. I love the entire range, and there is surely a piece to suit every taste and style. 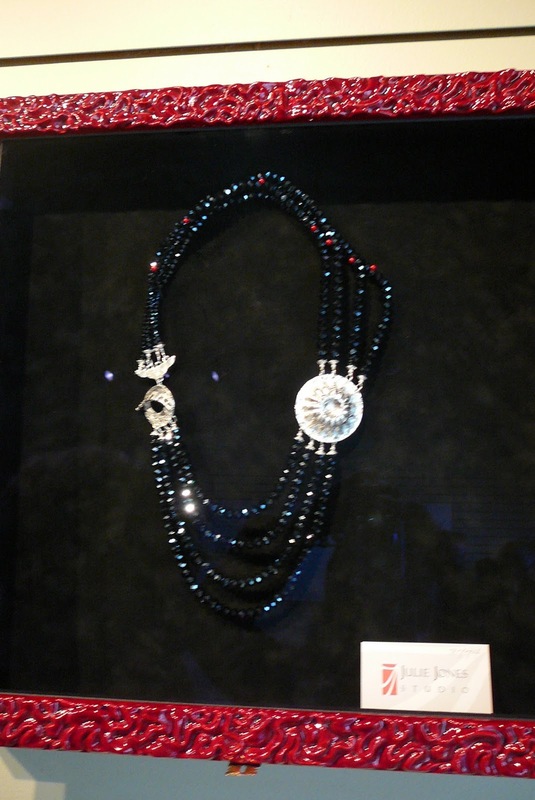 They are budget-friendly, too, considering they are handmade jewelry pieces and thus quite unique. I'm pretty certain one of these pieces is in my near future as I spotted several that I have begun to covet in a fairly serious way. Finally our attention turned to the work of Lucas Seaward - and people, I don't have enough words to express what I think of Lucas, his work, and his dream. 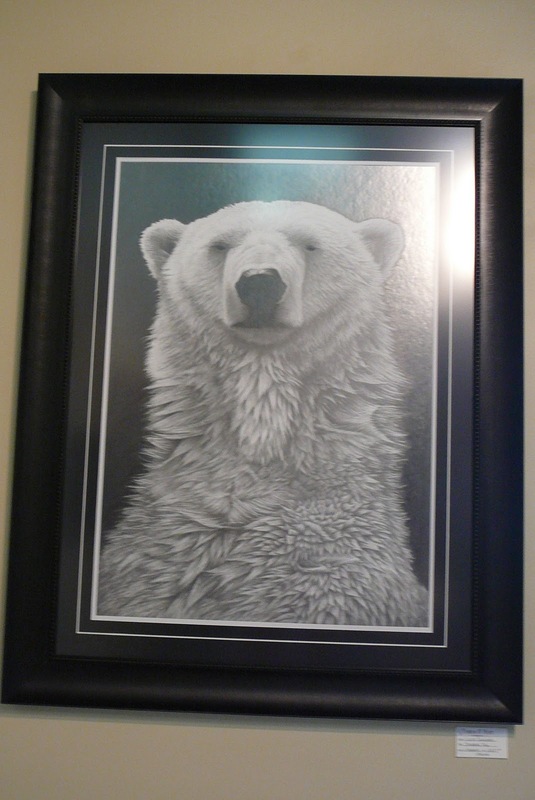 You see, Lucas is a wonderfully talented artist, one who has worked in the traditional forms like graphite sketching. But now, Lucas uses a different media - bitumen. 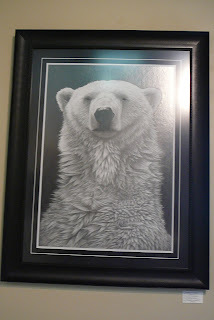 I first met Lucas at the Oil Sands Trade Show and fell quite completely in love with his work. Bitumen is not a traditional substance for art - it is difficult to work with, and it presents significant challenges. It is a media with a history, with an association to the oil sands and our region. And there lies the true beauty of what Lucas is doing, people. He is using a modified bitumen to paint incredible wildlife images, animals that pay homage to the history of this region, and he has a vision. He would like to paint an entire collection of these pieces and then take them on a travelling art show all over Canada. The goal? To showcase not just his art but to spread the word about Fort McMurray. He wants to use his paintings, these amazing bitumen pieces, to tell his story of life in Fort McMurray, and to show the world who we really are. When I first spoke to Lucas I was so excited, and I continue to be. I think he would be the most spectacular ambassador for this community and region, and I think his bitumen art has the potential to put an entirely new spin on the image of this area, and of the oil sands. I am quite completely taken by his vision, and I admire his passion, his talent, and his drive. I knew my husband would be enchanted by the bitumen paintings, and I was right (he even asked if the bitumen would ever dry and Lucas invited him to touch the pieces, to feel that his modified bitumen has become a very real media to create art). The Intrepid Junior Bloggers fell in love with the pieces, each choosing a favourite one and marvelling at the intricacy. Now, there was also food at the opening (and to the person responsible for the chocolate-drizzled cream puffs I'd like to say those are perhaps the best pastry I've ever had - and the chocolate-coated faces of the Junior Bloggers would indicate they agreed). There was pleasant conversation with the artists, and with Florence, the shop owner who has a clear passion for local art, and who I think is a huge asset to our community. We stopped after the opening to study the community art wall on the outside of the shop, and the Junior Bloggers were thrilled when I told them that Florence has invited them to come back in a few months when the art wall is changed and contribute their own pieces to it (the ride home was filled with talk of what kind of pieces they would like to do, from anime to splatter paintings). The Junior Bloggers were delighted to have attended a "real" art show opening, my husband was entranced by the thought of painting with bitumen, and as for me - well, I was once again simply delighted to be a part of this community. I was taken with all the artists, their work, and with the lovely Florence who gave them this place to shine. If you didn't make the opening you can still see the work of these local artists by visiting the links above, or, even better, visit Frames & More during regular business hours until November 12th. Stand in front of a breathtaking landscape photograph and let the colours wash over you. Try on a necklace or ring and watch it sparkle. Or, gaze at a bitumen painting and think about the history of bitumen, this area, this community, these animals, this art - and the threads that connect them all to each other, and to each of us. Check out some local artists - and let your spirit soar for a few moments. I can guarantee you will find one piece - one painting, one photograph, one item of jewelry - that will make your heart sing. And really, couldn't we all use moments like those? this is beautiful! Thank you for writing about the gallery and the show opening. Thank you McMurray Muisings: I appreciate your words, your time and your Intrepid bloggers time to visit my shop. There is some serious talent here. I love the photography. Exceptional colours. This show is wonderful. I can't believe how beautiful bitumen can be.